What to Do With Concord Grapes? 1 What to Do With Concord Grapes? A dollop of homemade jam is one of the sweetest ways to celebrate grape season. 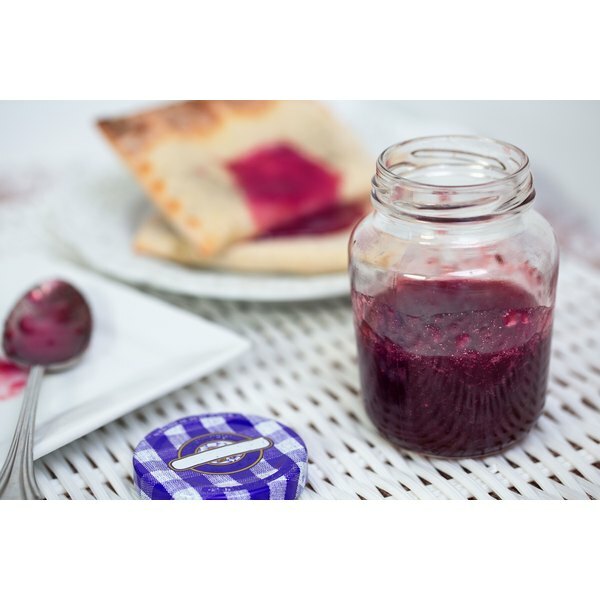 High in both pectin and sugar, freshly harvested grapes yield the best fruits for jam, which means you don't to add anything but heat and time to develop a rich, spreadable consistency. For the best results, pay a little extra attention to choosing the best grape variety for cooking and refining the fruits for the smoothest jam. Only Concord grapes have the unmistakable purple hue and acid-to-sugar balance you expect from grape jam. Concord grape season starts towards the end of summer and usually lasts until late fall, though this variety is also winter-hardy, so you might find them in colder months depending on the region. Seeded Concord grapes have a brighter, bolder flavor than hybrid seedless Concord varieties, so make them your first choice for jam. But if you only have access to seedless -- they're far more prevalent than seeded in regular supermarkets -- you can still make a quality jam. Check the grapes for bruising and firmness before you buy. They should feel plump and have unmarred, unblemished skin. Half of the jam-making process consists of rinsing and removing the skins and seeds. Concord grape skins are a catch-22; you need them for pectin and color, but you don't want the tannins they impart. You can overcome tannins, the bitter, astringent compound desirable in wine but not jam, with sugar, so you must peel the grapes. Concords have thick skins, however, so peeling them involves simply squeezing each grape over a bowl and letting the pulp fall into it. Reserve the skins to extract their pectin and anthocyanin -- the pigment responsible for their color. By cooking grape skins in a pot separate from the flesh and combining them later, you neutralize the tannins but retain the pectin that thickens the jam. Add the grape skins to a saucepan with water after peeling them; you need 1 tablespoon of water per pound of grapes. Set the heat to low and cook, covered, for about 10 minutes. Add the peeled grapes to the skins along with 1 cup of sugar for every pound, and cook over medium heat until the flesh breaks down, about 20 minutes. A food mill is your best friend when pureeing seeded grapes. Softened grapes pass through the fine holes of the bottom plate when you crank the handle and come out the other side smooth, leaving the seeds and skins behind. After the flesh breaks down, transfer everything in the saucepan to the food mill and mill it into a mixing bowl. Return the jam to the saucepan and cook it over medium heat for 30 minutes, stirring frequently. To get ready for the gel test, set a saucer or two in the freezer when you start cooking the jam. A spoonful of hot jam on a chilled plate lets you know right away if it needs more time. After cooking the jam down for 30 minutes, drop a spoonful on the plate and tilt it. If the jam doesn't run, it's ready; if it does, cook it for another 5 minutes and test again.